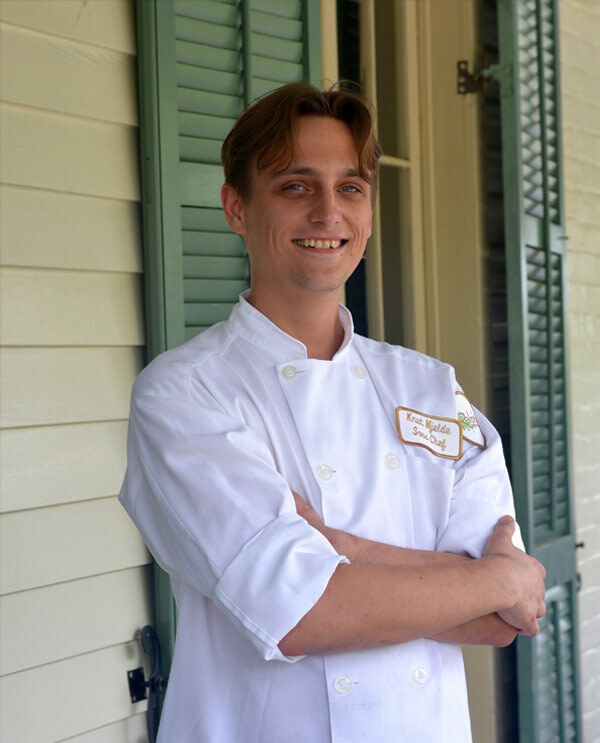 From Starbucks to Stella and settled in at Ralph's on the Park, sous chef Knut Mjelde has ascended the culinary ladder of success in New Orleans. A native of Hendersonville, Tennessee, Knut spent his days after school with his grandmother who made this deal with him - "If you help me pull weeds and do the heavy lifting in the garden, I'll cook for you." The gift of love through food and the desire to make others happy by nourishing them started Knut on his culinary journey. Shortly after high school Knut took his first restaurant job at September's Restaurant, in Hendersonville, starting as a dishwasher and working his way up to sous chef in this (SMALL, NEIGHBORHOOD??) eatery. On slow days Chef September Norman would inspire his staff by teaching new skills. "Who wants to learn how to properly cook a scallop? "… Exposure to exotic new flavors and techniques flamed Knut's passion to learn and do more. At September's Knut fell under the spell of his now fiancé, Emily, a seasoned cook and native New Orleanian who took him under her wing. As their relationship progressed and ready to immerse himself in an exciting new food culture, Knut asked Emily if they could move back to her hometown. Upon moving to NOLA, Knut knew he would be starting over, but he's the kind of guy who didn't mind. It was in a previous entry-level job at Starbucks, where Knut had worked off and on, that he was given one of his most rewarding opportunities – a place in the Coffee Master Program. Knut credits this program with opening up his palate through blind tastings and the deep knowledge acquired as to the sourcing, roasting, look, feel and smell of the coffee beans. Knut quickly started as a stage (intern) at the acclaimed Stella and worked his way back up to sous chef mastering such sophisticated techniques as butchery and molecular gastronomy and developing an appreciation for the importance of fresh ingredients and New Orleans flavors. When Stella shuttered and having heard good things about longtime executive chef Chip Flanagan, Knut applied for and won a sous chef position. Knut has been a catalyst for good at Ralph's on the Park, embracing the restaurant's emphasis on global flavors applied to seasonal local ingredients. Knut says, "Chip is so kind, humble and has a true passion in developing his team. He has taught me to give everyone a chance, even if they don't have the skills when they walk through the door. Chip says, we'll train them, not in our way, but in the right way, the traditional French way. " This philosophy of propelling others forward through mentoring dovetails with Knut's personal experiences. Knut's favorite food to cook is fresh fish, and he has a deep appreciation for the Japanese culinary style and their respect for the way they simply prepare fish and vegetables. His goal when preparing fish is for the end result to taste clean and fresh. He exclusively uses Japanese knives. With finely honed and ever-sharpening skills, Knut's future is bright and Ralph's on the Park is blessed to have Knut as a friend and colleague on our culinary team.